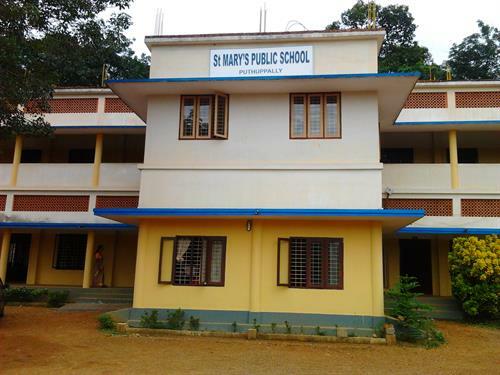 St.Mary's Public School situated at Vettathukavala near Puthupally in the district of Kottayam affiliated to CBSE is one of the foremost educational institutions in Kottayam while is popularly known for its home friendly atmosphere. Here I am sharing my 11 years of my acquaintance with the school. I am glad to write about an institution which had been a part of my life right from the beginning of my knowledge about the world. I am talking about St.Mary's Public School which is situated at Vettathukavala near Puthupally in the district of Kottayam. It had been a long 11 years of my acquaintance with the school which started from LKG onwards. Now, being in Std.IX, I do remember the days which I had been enjoying for the last one decade. Under the strong leadership of our school manager Fr. Joseph Mathew and Principal Mariamma T.C, the school which is affiliated to CBSE is one of the leading educational institutions in Kottayam is popularly known for its home friendly atmosphere. Most of the schools are located near roadside where it is contaminated and the polluted air which keep students keep a step backward from enjoying their school life. But I am lucky enough to get attached to a school which is free from the hassling environment. Good location and comfortable surroundings give extra power for the students for their mental and physical growth. We would be too lucky to get the companion of teachers from foreign countries who contribute their part in developing our language skills. Our teachers are also well educated and use their creative sense to add more to our life. Moral values are the basic need to attain a good spiritual life; the school is promoting innovative programmes which can make our future brighter. Inventive activities like Youth Parliament, Mock Interview, Quizzes, Photography, remembering special days and various other events aimed at the overall development of each student are being conducted at regular intervals. As per the instruction provided by the CBSE education board, the school provides us activities like char works, poster designing, assignments, projects, role play, seminar, book and article review, quiz programmes etc. The appreciation given the teachers make students get attached to school and make them participate in the series of events organized here. The positive atmosphere clubbed with novel ideas keep the students confident and courageous to be a part of daily activities. I am proud to be a part of the school which won the first prize for English Drama at the State Sahodaya Youth Festival. The unity shown by the teachers and students add more strength to day today activities of the school. We are blessed with 6 male teachers and 20 female teachers who get attached to us and keep a strong vision about our future. The much talented students of the school do show their skill in academic and co curricular activities. The school had been achieving 100% excellence in 10th board exam with the students going out in flying colours. Other than giving importance to the physical actions, much care is given to improve the creativity of the students. Training in stitching, painting, drawing, collage, art, craft works, drawing and painting are given to the students. The school which is follows a unique concept is able to attract more students every year. While looking back, I feel proud of an institution which had been providing the necessary amenities for the students time to time. Looking forward for the potential growth of the school, and wish to see it reach more heights in near future. O.E.M Public School situated in Eraviperoor near Thiruvalla keep its head high being one among the schools which an homely environment to the staffs and students. Being a teacher in the school for a year, I am glad to share my experience in the school. Bethany St.John's school is one of the best schools in Thrissur district. This school was established in the year 1965 by the Bethany Religious Community. This school is one among the few school which teaches moral values towards humanity other than the academic subjects. Let's learn more about this school in the article below. Mahatma Gandhi Memorial School in Trivananthapuram has gives an immense periodic way for children to learn. Knowledge is Wisdom. Knowledge is Experience. Knowledge is Education. The only way to gain knowledge is Schooling. Knowledge cannot be learned it can be experienced. Many peoples in society put forward their steps to teach knowledge through schooling. The detailed description about this school, facilities and infrastructure are described below in detailed features. There are many international schools in Kerala among that Trivandrum international school is the best and first international school in Trivandrum. This summary includes detailed description about facilities, admission details, rules of the school and contact details. Take a glance and know the details about it. Would you like to know about Sainik School Kazhakootam Trivandrum? Find here Sainik School’s infrastructure facilities, departments, activities and contact address. The Sainik School is one of the greatest school in Kerala.